Explanation: Taken from an Atlantic beach, Cape Canaveral, planet Earth, four identically framed digital images are combined in this night skyscape. Slightly shifted short star trails dot the sky, but the exposure times were adjusted to follow the flight of a Falcon 9 rocket. The September 21 launch delivered a Dragon X capsule filled with supplies to the International Space Station. Above the bright flare seen just after launch, the rocket's first stage firing trails upward from the left. After separation, the second stage burn begins near centre with the vehicle climbing toward low Earth orbit. 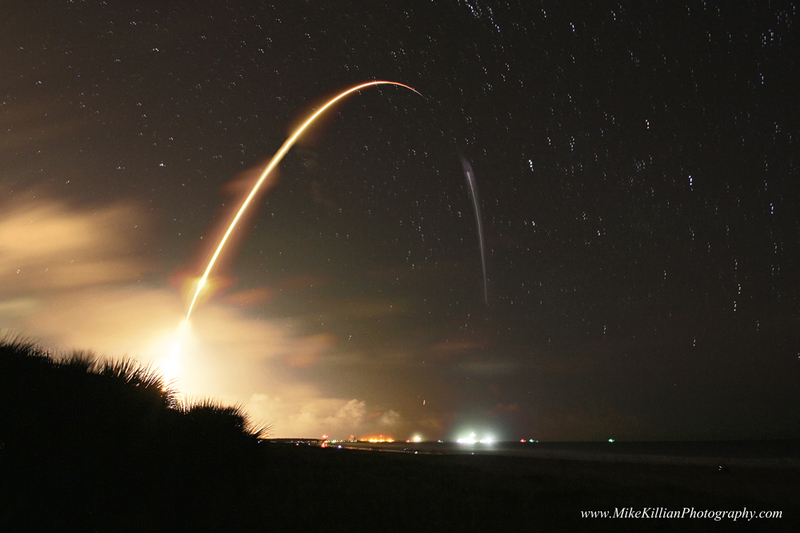 At the horizon, the flare near centre records the re-ignition and controlled descent of the Falcon 9's first stage to a soft splashdown off the coast.